Be the first to share your favorite memory, photo or story of Porter. This memorial page is dedicated for family, friends and future generations to celebrate the life of their loved one. 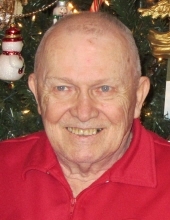 Porter Wayne Plemmons, age 91, passed away peacefully on February 9, 2019. Porter was born on May 14, 1927 to Porter and Essie Plemmons in Asheville, North Carolina. At the age of four, Porter moved with his family to Michigan. As a young man, Porter proudly served his country in the Navy at the end of World War II, where he earned the World War II Victory Medal. After the war, Porter went on to serve his fellow people as a police officer in Detroit. After many dedicated years of service, he went onto other various endeavors. In his free time, Porter loved to woodwork, listen to music, and enjoyed collecting guns. Beloved father of Greg (Carol) Plemmons, Debi Chapman, and Patty (Sam) Marchese; proud grandfather of Michael Plemmons, Barbara Santana, Christopher (Katy) Plemmons, Victoria (Brandon) Hawald, Sam Marchese, Emily Plemmons, Philip Marchese, Ron (Sarah) Chapman, Erica (Adam) Chapman Hall; loving great-grandfather of Makayla, Tyler, Blaise, Lauretta, Jayden, Carson, Reagan, Ronny, Lincoln, Adley. Preceded in death by the love of his life, wife of 64 years, Yvonne Plemmons; cherished children Jeffrey and Sandra; dearest parents Porter and Essie Plemmons and loved grandchild Kendall. Visitation on Thursday, February 14, 2019 at Lee-Ellena Funeral Home from 2-9PM. Burial and military honors on Friday, February 15, 2019 at Roseland Park Cemetery at 10AM. Please meet at the gates. In lieu of flowers, donations can be made to the Fallen Patriots. Burial with military honors to take place. "Email Address" would like to share the life celebration of Porter Wayne Plemmons. Click on the "link" to go to share a favorite memory or leave a condolence message for the family.